Knightcorp offers wealth management as well as business and personal life insurance covers. We understand that getting the right advice at the right time can make a big difference in helping our clients reach their financial goals. Whether it’s having enough superannuation for retirement, planning for your children’s education or simply having the lifestyle you want Knightcorp can help. Whether you’re starting out, have a family or are planning for retirement one of our financial advisers can develop strategies for your specific situation. Most Australians will insure their car but neglect to insure their most valuable asset – themselves. Statistics show that most people do not have sufficient life insurance to assure their home loan and an adequate lump sum is paid out to assist their families in the unfortunate event of their death. What would happen if you became ill or injured and your income stopped today? Would you and your family have adequate income to meet the repayments on your debts? If you have a family, what monthly income would you require to meet the bills? Would you and your family still want to maintain your current lifestyle? How long could you survive on your existing assets? Please book an appointment with a Knightcorp Financial Advisor to discuss your details further. When you invest your money, you need to set a timeframe, that is, you’ll need to decide whether you are investing to meet short term needs such as saving for a holiday, for the children’s education or investing to meet financial needs in retirement. If you’re investing for the short term, shares are generally more risky because of stock market volatility. Some of your money could be lost as share prices rise and fall from day to day. You simply can’t predict what you’ll get back at the end of your investment period. When you’re investing, there are lots of different types of ‘baskets’ to choose from: cash, fixed interest, property, shares (Australian and international). You can spread your money across different countries, individual investments or investment managers. The idea is to reduce the impact that any one of your investments would have on the total value of your investments, should it perform badly. Assets move in different economic cycles so when shares do badly, bonds or property might do well, or vice versa. This helps reduce risk and increase your returns. People nearing retirement often think they should move their savings into ‘safe’ assets. But watch out. In reality, the safe option may turn out to be the risky option. Here’s why. It’s common for people to spend 20 years or more in retirement. History shows that riskier assets that may give better growth in the long run tend to experience more highs and lows in the short term. But over time, risks can diminish and they may do better than lower risk assets. 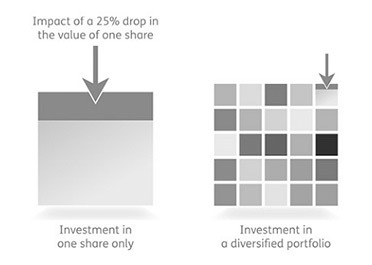 The risk-return spectrum is the relationship between the amount of return gained on an investment and the amount of risk undertaken to obtain that return. Generally, the higher the return sought, the greater the risk experienced. Smoothing up the ups-and-downs generated by exchange rate movements on the value of international investments, with the focus on risk and not return. Protecting investments against a number of unwanted risks by taking an offsetting position in a related security. The spreading of investments across different classes of assets and securities within these asset classes, and different types of investment vehicles. A collective scheme allowing individuals to invest in a large portfolio of assets and a wide range of investments. 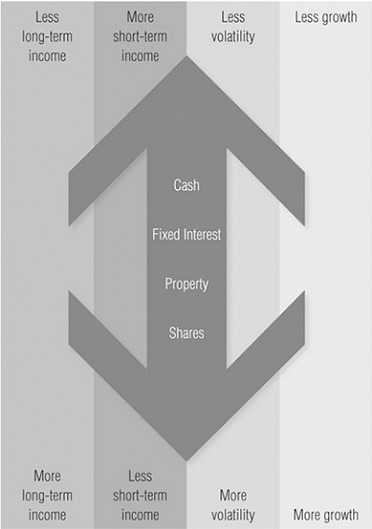 Costs and benefits are shared and risk is reduced due to the wider spread of investments in the portfolio. Obtaining financial security is about more than just sorting out your financial situation – it’s about thinking of every aspect in your life and what you want to achieve. There are many resources available to help you plan for your financial future, including books, websites, seminars and self-help tools. At Knightcorp we have pleasure in recommending the below resources for you to review. Knightcorp Financial Services Pty Limited ABN 44 154 765 054, is a Corporate Authorised Representative to provide financial advice services only under ClearView Financial Advice Pty Ltd ABN 89 133 593 012, AFSL No. 331367. All other services provided by Knightcorp and their related entities are not the responsibility of, nor endorsed by Matrix and this includes related services provided by referral partners or associated professionals.